I use QGIS and have a geological map for a large area. I present this after ID codes based on the geology ("Geokartnr" in photo). I want to use international/nation color codes for each rock type, this way it will be comparable to other peoples work. The international colors is already added to the attribute table as a RGB code ("RGBfargko"). Is there any way I can sort/present the maps by "geokartnr" code and present this by the color codes in the RGB codes in the attribute table? Or do I need to change all colors manually? 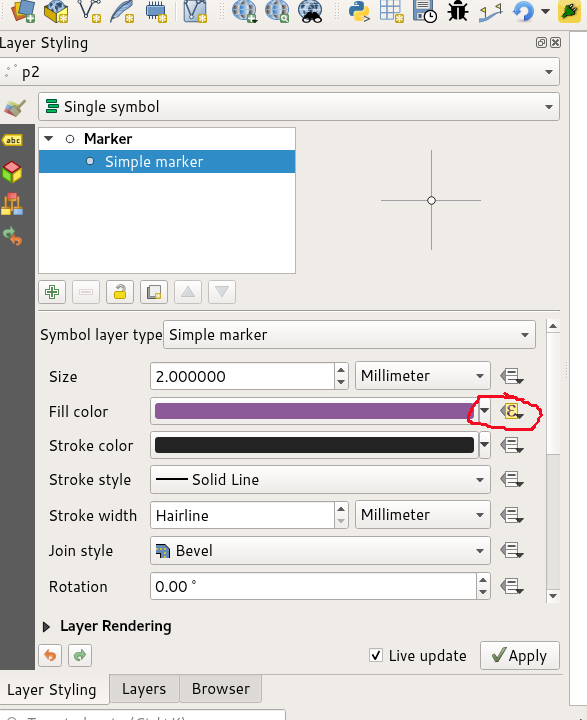 In the layer styles panel if you click on simple marker, there is a small box to the right of the fill color combo box - if you click on it you can select edit from the menu and enter the expression editor. Then click ok and your colors should show up. AS @J. Monticolo supposed, use Data defined expression in symbology properties. 1- function string_to_array : transform the field data into an array by splitting at the white space character ; 2- function array_get : get elements of the array, the first item has an index of 0 ; 3- function color_rgb : with 3 arguments (R, G, B), this function return a QGIS color. EDIT The solution of @Ian Turton is more visual and simple ! Not the answer you're looking for? 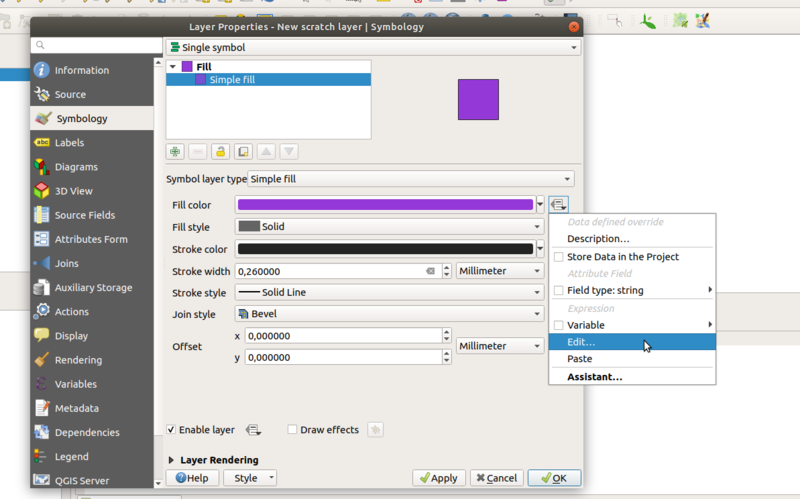 Browse other questions tagged qgis attribute-table visualisation vector-layer or ask your own question. PyQGIS: how to delete layer from TOC when attribute table is closed? Finding out and editing specific rows of attribute table in line shapefile using Python? Transfering vector Style classification into Attribute table in QGIS? How to edit the attribute tabel of a shapefile when the enable editing is greyed out?